CONFLICTS for any reason may RESULT IN your child's part being given to another cast member. ANY possible conflicts must be cleared with Rosy at centerstagechildrenstheater@gmail.com or 760-586-1932 BEFORE your audition. Rehearsal will run from 4:30-6pm, followed by a mandatory parent/guardian meeting from 6-6:30pm. Children will be supervised by our high school helpers during the meeting. Welcome to Cast and Crew info page. This is where you will find the most current info on things related to this production. Please check this page often as there will be updates during the rehearsal and performances for Annie Jr.
Join our parent Facebook page to connect with other parents, carpooling, networking etc..Also, please like CSCT's Facebook page, help promote Doctor Dolittle Jr. through our FB events. Please sign up to help on one or more of our parent committees. We ask that you commit to a minimum of 6 hours per child enrolled in the production. Registration for New Cast and Crew Members of CSCT. Being part of a CSCT show is a commitment to the production as well as the entire cast and crew. Casting is based on many different factors and kids may sometimes be disappointed if they don't get the part they hoped for. However, we at CSCT strive to create a nurturing environment where kids will grow during the entire process. We appreciate that parents and kids respect the director's casting decisions and trust that the directors are making the best choices for that particular production. It is not acceptable to drop out of the production if your child does not receive the part they hoped for. We expect that children and parents will find the value in even the smallest of roles as well as the great responsibility that comes with a large role. Remember, it's not the size of the part, but what you do with it! In addition, please remember that once registered, you will clear your schedule of any possible conflicts. Though we understand that sometimes there are unforeseeable circumstances such as a family emergency or illness, which will be handled on a case-by-case basis, it is of utmost importance that your child attend every rehearsal they are called for. ​CONFLICTS for any reason may RESULT IN your child's part being given to another cast member that attends all anticipated rehearsals. School activities, vacations or any other outside activities are not considered valid excuses to miss rehearsals. Please read and discuss the following rules and consequences with your child. 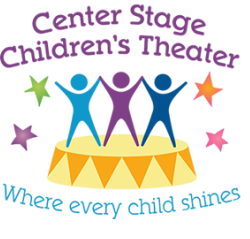 Center Stage Children’s Theater Staff recognizes and respects children as people with unique feelings, values, and needs. We believe that positive reinforcement and behavior modification through consequences are effective methods of interactions, particularly when dealing with behavior problems. 1. Reasoning: Communication between the child and staff member to identify the problem and determine a possible solution. At this point, children are given a chance to explain what happened and to make a choice about what they should do next. 2. Removal/loss of privilege: Removal from the activity for a short period of time. This allows the child to gain control of a difficult situation. Time outs can include activities which might lead the child to consider alternate behaviors. The staff might ask that they make a short list of alternate ways to handle the situation, write or draw a letter of apology, or perform a short community service project. 3. “Think and Writes”: In a case where reasoning and time outs have failed, or when a child has had 3 consecutive time outs, the child will complete a “think and write”. ‘‘Think and writes’’ allow the child to document what rule they have broken, what consequence they received, and what they will do next time to avoid breaking the rules. Parents will be notified when they pick up their child. All “think and writes’’ will be filed and kept confidential. 4. Parent Conference: An informal parent conference will occur when repeated behavior problems occur and/or when a behavior is particularly dangerous to the child, staff, or other children. Parents, the Child, Camp Director, and Program Director will discuss the behavior and possible solutions. Future consequences for continued behavior and future rewards for improved behavior will be agreed upon and documented at this time. 5. Suspension/Dismissal: If the agreement is not upheld, another meeting will be held with the child, staff and parents. At this time, a short term (up to 1 day) or long term suspension will be required and a discussion as to whether this is the right program for your child will occur. If the suspension is not effective, the child will be dismissed from the program. Refunds will not be given for suspensions or dismissals. Parents should always be aware that if your child behaves in a way that puts him/herself, staff, or other children in danger (violent behavior, threats toward or striking staff, running away from the Club or Site), you will be called and asked to pick up your child immediately regardless of previous behavior. A suspension will immediately be effective for any such behavior. I, have read and agreed to all policies and procedures listed in the Behavioral Management Policy of CSCT. I have directed all questions about these policies to the Program Director. My child and I will discuss the CSCT rules and consequences for not following the rules, outlined in the Behavior Management Policy. My child and I agree to support the rules and consequences detailed in the CSCT’s Behavior Management Policy. I hereby give my consent to Center Stage Children’s Theater to photograph, film, videotape and then use, reproduce, and publish said images of me and/or my child/ children.